Carrots are one of the inexpensive, long-keeping vegetables, essential for my frugal autumn and winter cooking. We go through a little more than 5 pounds of carrots per month, here. Every fall, I buy at least one, sometimes two, bags of juicing carrots. They come in 25 lb plastic bags. Yes, that's 25 pounds! I have found them at the produce stand as well as several of our area markets, alongside the other bagged carrots. 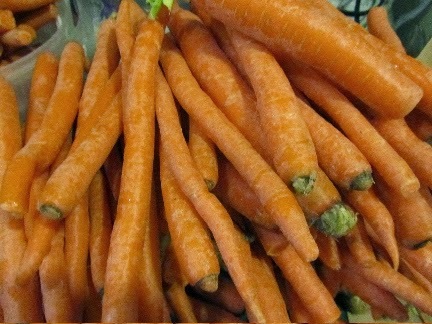 Juicing carrots are just like regular carrots, perfectly clean, edible and suitable for table use. It's just that there may be broken carrots (most often broken during the mechanical sorting), carrots with blemishes, and irregular shaped carrots. 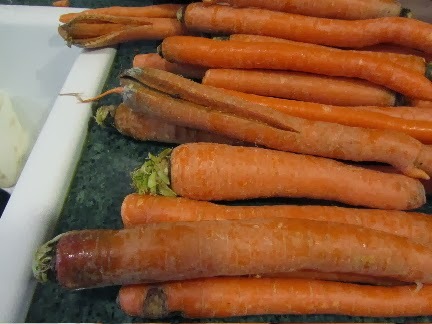 I've never found a moldy carrot in a bag of juicing carrots, and only one or two floppy carrots per bag. 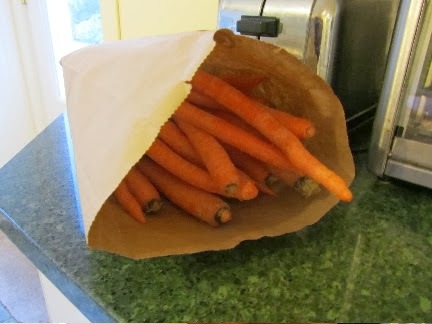 To give you an idea of how much I save on carrots by buying the 25 lb bag of juicing carrots, instead of the 5 pound bag -- this month, the 25 lb bag was $7.98, about 32 cents per pound. At the same store, the 5 lb bag was selling for $2.79, or 56 cents per pound. 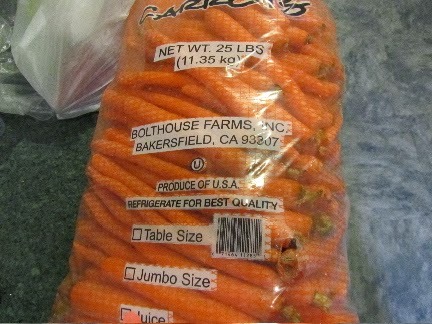 I saved 24 cents per pound, or $6 (on the 25 lbs) by buying our carrots in the 25 lb bag. When I get the bag home, I sort them right away. Getting the carrots out of the plastic is essential. Trapped moisture could lead to rot. 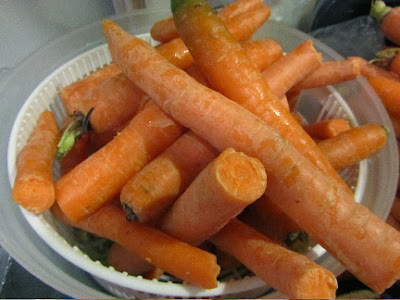 I have one pile of broken pieces, one pile of blemished or floppy carrots, and one large pile of good keeping carrots. I deal with the blemished/floppy carrots, first. These are the ones that could be lost to spoilage if not cooked or frozen right away. Some may be split (I cut those portions off). Others may be blemished (again, I trim those portions out). And one or two may be a bit on the floppy side (best to use or freeze today). I peel, trim and chop them for the freezer. They'll be handy when I need some diced carrots for soups or stews. Next, I bag the good keeping carrots. I divide these carrots into about 5 lb. parcels each. I do a double layer of paper inside of plastic, to keep the carrots fresh and crisp for months. 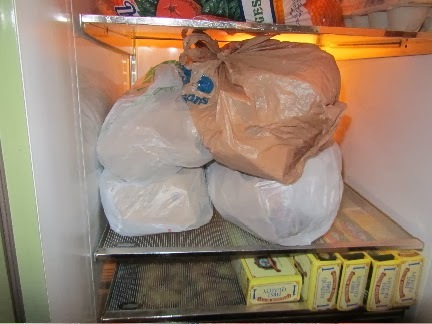 I wrap them in paper towels, or loosely place in small paper bags, then slide into plastic grocery bags. The paper absorbs excess moisture, while the plastic bags hold hold just enough moisture in, to keep them fresh. I check on each parcel of carrots every other week. (If I find that the carrots seem a bit dry -- going floppy -- I sprinkle the carrots with about 1 teaspoon of water, wrap back up and check again the next day. A quick sprinkling of water will usually cure the "floppies".) They will keep for 3 months or more in my garage fridge, when stored this way (I usually run out of carrots in late January). Finally, I place the broken carrot pieces into the salad spinner, cover and keep in the kitchen fridge, to use within a week. Our family can easily use 25 pounds of carrots in just a few months. We make carrot soup, carrot desserts, roasted carrots, carrot salad, carrot sticks, carrot-potato puree, and I add them to soups and stews all season long. Do you use carrots often in your cool-season cooking, too? What are you favorite ways to use carrots? I am always looking for new and interesting flavor combinations. 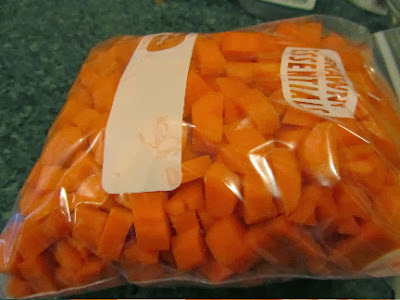 Do you blanch your carrots before you freeze them? Good idea with the paper bag and plastic bag surrounding everything. We also go through a lot of carrots but I'm afraid we are pretty dull in our use--carrot sticks are often the vegetable of choice for my kids for lunch and dinner. I add carrots to soups and stews as well. A good friend passed on the tip about wrapping in paper towels, then plastic, many years ago. I had heard the old time way to keep carrots is in sand in an unheated basement. But I have neither sand nor a basement, so this works really well for me. My daughters make a delicious curried carrot soup. I'll have them find the recipe for me and I'll post it. It may not be to children's tastes, but you and your hubby may like it. Carrots, cooked and pureed also make a good substitute for some of the pumpkin in breads, muffins and pie. Wow, what a great price on them, Lili. Where do you buy them at that price? Do you blanch them before storing them in your freezer? I use a lot of carrots in soups and stews, especially since switching over to a plant based diet. I tried juicing carrots to use as a soup base, but it was way too sweet for me, so I don't use it for that. I love carrot juice. Carrot-apple juice is my go-to drink/meal when my tummy is not well. Interesting that you tried carrot juice as a soup base. I could see carrot juice working in some savory dishes, but get the too sweet element wouldn't work in many recipes. You're right about carrots being inexpensive. I find carrots at $4.95 per 25# bag. I use it for juicing, carrot soup, lentil and carrot stew. I need to find a carrot cake recipe. I want to shop where you shop!!! $4.95 for 25 lbs of carrots is a fantastic price! Wow, that's a great idea. I'd never thought of freezing some of them. I always look at those huge bags and I'm tempted to buy one, but I'm never sure what I'd do with all of them. Thanks so much for the how-to. 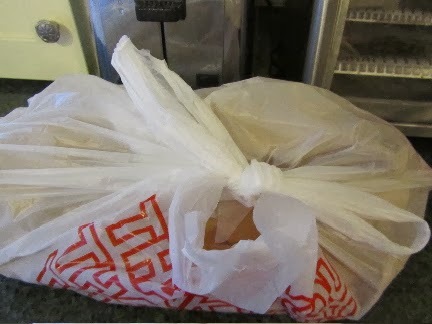 I am always surprised how quickly we go through these large bags. Having them here in the kitchen motivates me to find new ways to cook carrots!